It was evident at the market this past weekend, that the last of the wintertime squash is just barely hanging on. Butternut squash is definitely one of my favorite things to cook during the cold winter months. I love it roasted, cooked with risotto, served alongside a nice pork roast, steamed with a little butter and most of all as a soup. I made this wonderfully creamy Butternut Squash Soup with Crispy Chorizo Croutons with a rich chicken stock, lots of toasted cumin, caramelized onions and a little carrot. It is delicious, so delicious, that I am thinking I may have to make a couple batches to freeze so we have some lazy evening suppers! Heat the olive oil in a large soup pan. Add the onion and cook over medium heat until soft. Add the garlic, stir. Add the butternut squash and cook over medium-low heat until caramelized, about 20 minutes. Add the cumin, stir. Add the stock and simmer until the squash is tender and starting to fall apart. While the soup is cooking, you can pan fry the chorizo slices until crispy. After they are cooked remove from the frying pan with a slotted spoon and lay on a folded paper towel, this will absorb extra fat. When the squash is cooked, puree the mixture in small batches in a food processor or blender. It will be very hot so be very careful. Season with kosher salt and pepper to taste. Put into soup bowls and garnish with chorizo, thyme, and a drizzle of olive oil or the oil left from pan-frying the chorizo. 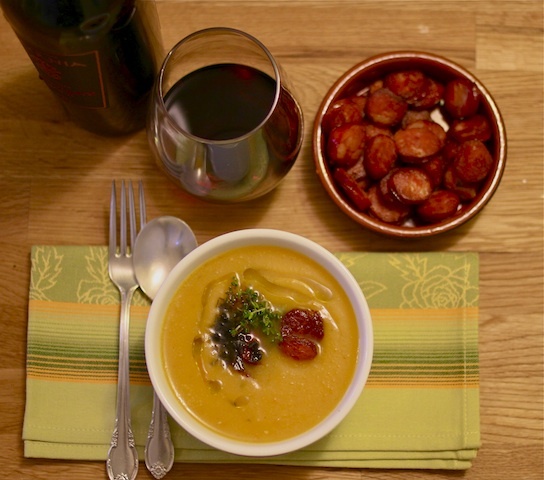 3 Responses to "Butternut Squash Soup with Crispy Chorizo Croutons"
Now I see it! LOVE the chorizo finish, Lord how perfect (especially the drizzle of "yummy fat from the chorizo" rave, definitely, ha). Beautiful. I can just envision the crispness of that salty chorizo -- the perfect foil for some sweet squash soup. I don't blame you for trying to preserve these flavors. They're downright perfect.